When owners introduce their puppies or kittens to people or other animals, and expose them to various environments within first few weeks, the animals tend to have less stress and have fewer issues later in life. They get into a habit of welcoming change and are not scared or nervous to take a start under new situations. Animals have been pre-programmed at birth to be fearful of individuals and things that are not part of their daily experience. When they are in danger or feel threatened, animals react inappropriately to these situations. For this reason, socializing pets often and exposing them to a new environment during early years makes them friendly, adaptable and less aggressive. Pet owners should keep in mind the following tips when they begin socializing their pets. 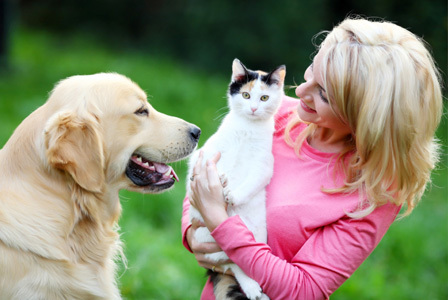 - During the initial sixteen weeks, pets should be made to go out on a daily basis. It is also important to allow passers-by to be playful with your pet that makes them friendlier and approachable. - While socializing, it is important to reward your pet with little treats that will make them more responsible in carrying out duties and this way they will show acceptance in learning anything new. - Puppies, kittens or other pets are in a constant state of learning. It is, for this reason, it's recommended to give your pet a minimum of 30 minutes training every day. - A trip to vets office for vaccination is good way to help socialize your pet. Pet socialization classes or training classes provide the best-suited environment for developing their interactive skills. - In order for pet owners to be trained for socializing, it is important for you to get exposure on social networking sites. It will enable you to communicate with others, give you a cheerful demeanor when dealing with the public and make you more popular among other pets and their owners. - Pets and their owners who socialize on a regular basis ensures that they are well adjusted when in strange environments and are less fearful under new situations or while interacting with strangers.